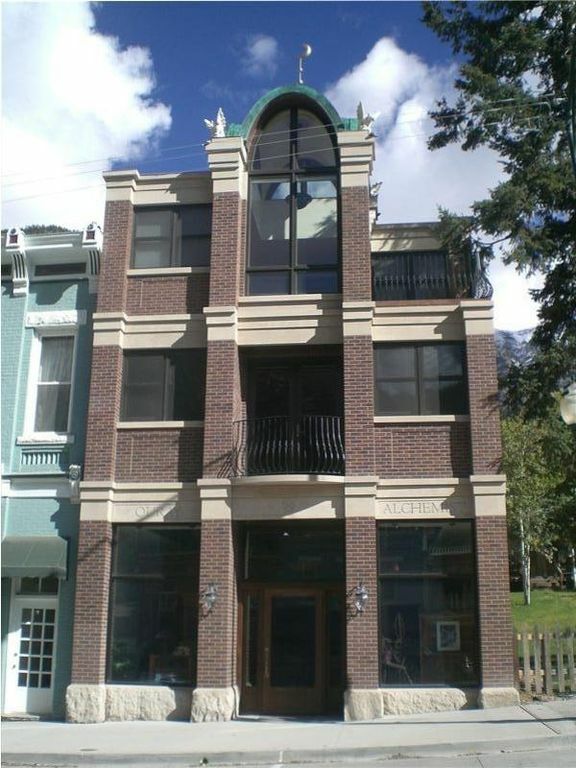 Cette nouvelle suite penthouse de marque 1000 sq ft + se trouve au troisième étage supérieur de l'immeuble nouvellement construit Ouray Alchemist dans le coeur de la ville. Stores plissés bidirectionnel offrent l'excellente combinaison de 360 ​​degrés à couper le souffle entourant vue sur la montagne avec juste la bonne quantité de la vie privée souhaitée. Il est le refuge romantique parfait pour profiter des nombreuses activités dans la région Ouray aventureux. Il ya un pont de 400 pieds carrés de qui vous donne des vues privées de la mine Ouray chef, Cascade Falls, l'amphithéâtre et de Twin Peaks. En outre, il est un petit petit balcon donnant sur la rue principale avec un géant sapin de Douglas juste au sud procurant de l'ombre et de la vie privée de ceux qui veulent voir ce qui se passe autour de la ville. Le Ouray Alchemist est un projet de longue date pour Curtis et Nancy. Curt a été la collecte des artefacts de pharmacie depuis de nombreuses années. L'espace commercial dispose d'une collection historique de souvenirs de pharmacie datant de 350 avant JC. La collection est un hommage à l'histoire de la pharmacie, contenant de nombreuses bouteilles étiquette-sous-verre soufflé à la main avec les médicaments originaux (herbes et racines) avec un accent vers l'exploitation minière et de l'histoire de la pharmacie Colorado (comme la prescription écrite la plus ancienne dans le Colorado) . Il est un hommage inoubliable à la pharmacie vaut le détour lors de votre séjour. Pharmaciens Curt et Nancy vont faire le meilleur pour rendre votre visite en vaut la peine. Le Ouray Alchemist, ce que nous appelons notre zone commerciale et le musée, vient d'être présenté sur la couverture de bouteilles et Extras - Jan / issue Fév long avec un article. Nous sommes également en un article écrit sur nous dans GV Magazine. Cette signifie Grand Valley et est distribué principalement autour de la région de Grand Junction. Grand Junction est à seulement deux heures de route de Ouray. Le bâtiment Ouray Alchemist est unique dans la région Ouray. Profitez de la fleuron lunatique dépeindre le soleil, la lune et les étoiles. Les gargouilles placées sur les quatre coins de la tour de cuivre en forme de dôme par la protection de l'offre de la tradition et de bonheur à ceux qui aiment cette suite incroyable. We are so glad that you felt comfortable and welcome at the penthouse! Just about all our guests travel quite a distance to get to Ouray. It is a magical scenic place that is well worth it to come visit. Many people park their car in the locked garage and explore Ouray on foot. It is a nice break from the driving that we all do and the best way to take it all in - the beautiful mountain views and the quaint small town atmosphere. Many hiking trails start within a few blocks of the penthouse. Also the vast majority of restaurants, shops, grocery store, bank, post office and attractions are a "hop, skip and a jump" away. We welcome folks to come experience the best place to stay in town. Ray and Faye - we do hope that you will return soon! Staying here was like stepping into a the best kept secret in Ouray. The views are amazing and being able to walk downtown was a game changer. Curt and Nancy are excellent hosts. Highly recommend staying here. Thank you for your wonderful review! It is nice being in the heart of town so you can walk to most restaurants and shops and breathe in the ambiance of Ouray. We are so glad that you enjoyed your stay. The penthouse is a gem of a place with its great views. We keep it clean and comfortable for our treasured guests. Perfect location with excellent views! We stayed over the New Year's holiday and really enjoyed our stay. The Penthouse was the perfect location for walking to shops and restaurants. It was very clean and had many thoughtful extras. The Penthouse has a great layout and plenty of room for the 2 of us. Although we didn't cook, everything needed was there. The views are phenomenal! We will definitely stay here again on our next trip to Ouray. Happy to hear that you enjoyed your stay at the penthouse ringing in the new year! It does have a great layout with the bedroom in the back for quiet sleeping time and spectacular views of the ampitheatre mountains. We are pleased that you plan on returning some time. Thank you for your thoughts and comments. Nancy & Curt's Ouray Penthouse was by far the best vacation rental experience we've had. Not only was the check in process quick & easy (despite being a holiday), the unit itself was everything described and more! The central location on Ouray's Main St made getting around easy, and when we did drive it was nice to not have to scrape ice off the car with the provided parking garage. The best part of the whole experience was watching the moon rise over the mountains through the tall picture windows while lying in bed. Also, make sure to visit the Alchemy museum downstairs, but give yourself plenty of time to do so and take the tour... Curt's knowledge of both Colorado & Pharmaceutical history is unparalled. This experience is highly recommended!!! Thank you for your wonderful words. We feel so rewarded when folks take the time to write a review. It is hard to capture the magic and beauty of the penthouse through pictures. So glad that you got to see the moon rise! That is one of the most incredible experiences that you can have in Ouray, especially in the winter when the light of the moon makes the snowy ampitheatre just light up. It is breathtaking. We enjoyed having the two of you here immensely and will always welcome you back. Thank you also for touring the museum. We love when our guests have interest in the history of this area and of pharmacy/medicine/dentistry/alchemy. It all ties together and is fun and an entertaining presentation. Curt and Nancy put so much thought into this penthouse. The layout, the views, the amenities...we lacked for nothing during our stay. Over the years, I’ve stayed in condos throughout Ouray and rented a couple different rooms at the Beaumont. This penthouse has views unlike any that I’ve experienced! We were lucky enough to have several clear nights where we could watch the moon rise over the Amphitheater. What an amazing sight! Everything was so clean. This is truly a home away from home. Thank you! We feel blessed to have spent the week surrounded by such beauty. Thank you for your wonderful review! We designed the large barrel bedroom window just for that magnificent view of the moon rising over the Ampitheater. You can watch it from anywhere in the bedroom or while laying in bed. It is magical - something that you will never forget. We couldn't be more pleased that you enjoyed your week here in Ouray staying at the penthouse. Beautiful views and excellent location. This place is amazing. The house had plenty of room for the 2 of us and the owner was charming and cordial. It was a bit chilly outside when we were there but the in-floor heating was SOOOO nice! No cold floor when getting out of the shower!!! It was quiet and the bed was comfortable. They even had some beach towels to use at the hot springs (which are new and improved and a lot of fun!) We love Ouray and have been here several times and this little gem made this trip that much better. You can't say enough about the views. Even if you don't get out much you can enjoy the views that were obviously a big focus when building here. The views out of the living room and bedroom are perfect. You can see the peaks on both side of the valley. The east peaks are visible from the huge bedroom windows and the west from the huge living room windows. There is a small balcony on the front that would have great views of main street and a very nice sized deck on the back that looks towards the cascade falls. You will need to climb a flight of stairs but if you are visiting Ouray then you will already be doing some walking up inclines so the stairs shouldn't be a challenge. We will definitely be staying here for our next visit to Ouray! Thank you for your review! If you are going to vacation in one of the most beautiful places in America, you should stay at our penthouse which really helps show the Ouray area off. As mentioned, we have large windows that showcase the surrounding mountains. Lots of amenities make it a comfortable and romantic place to stay. The in-floor heating is a plus during the fall and winter. We keep it very clean and take pride in knowing that people enjoy staying with us and plan to return. There is a $500 totally refundable damage deposit-most people put on their credit card upon arrival so it can be easily refunded upon departure. There is a simple contract to sign which I would email to you upon booking. There is an extra charge for a 3rd person. 4th of July time frame requires a 6 day minimum stay.